Getting around Vietnam is quite cheap however you choose to travel, but when it comes to the freedom and the opportunity to explore the places where you want to go, then traveling by scooter is a good option. However, some people will take one glance at the traffic that they see in Ho Chi Minh City or Hanoi, and immediately change that opinion, and there are plenty of other travel methods available too if the traffic situation is too scary. Having seen the huge numbers of people already traveling by scooter, if you still do want to explore in this way, then here are a few tips to help you with your journey. Should You Hire or Buy a Scooter? This will often depend on how long your trip is going to be, and whether or not you intend to do a point to point journey or if you can travel in a loop route that returns the bike to the same location. If you are traveling from Ho Chi Minh City, purchasing a scooter there is more expensive than elsewhere in the country, as a Top Gear episode was filmed starting from the city formerly known as Saigon, and people are still trying to emulate this. Otherwise, you can usually find a cheap second-hand Chinese scooter for around 500 US Dollars, or a genuine Honda Import for a few hundred dollars more, which is worth the investment if you can afford it. Renting a bike will usually cost around 10 US Dollars per day for a reasonable bike, although some cheaper scooters can cost as little as five dollars, or 100,000 Vietnamese Dong. Make sure you get a deal that includes a full tank of gas and a helmet. The most popular route is that which was featured in the Top Gear show, from Ho Chi Minh City to Hanoi, but there are so many coastal areas to visit, it is worth giving yourself plenty of time. Hue is a lovely place to stop if you are traveling the coast road, while the highlands inland are also very nice. The coast of the Mekong Delta southwest of Ho Chi Minh City is also worth a look. 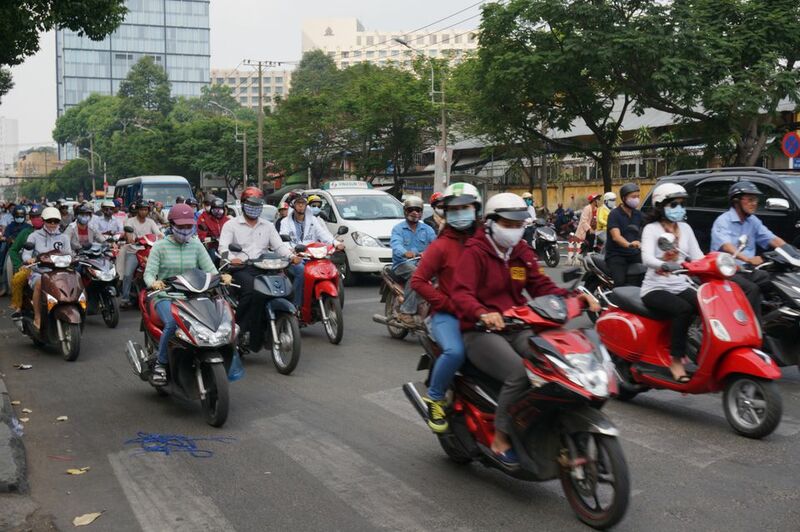 In the cities of Hanoi and Ho Chi Minh, make sure that you are driving very defensively, and give yourself plenty of space, as there are thousands of scooters on these roads, and try to stay on the edges of these groups of bikes. Outside the cities, road conditions can vary, so make sure you keep an eye out for potholes, keep well to the side if a car or truck is overtaking, and try to avoid driving at night. While the biggest safety tip of all is to try and keep your time on the roads of the big cities to a minimum, you should also consider the time you have for the journey, as you don't want to give yourself too much distance to cover each day, as driving tired or at night is riskier. If you do find yourself in a convoy of tour buses or trucks, be ready to pull over and let them pass, so you can ride in more space where possible. This can be a concern for many people, as bike thefts are fairly common in Vietnam, as they are easy to transport and can be reconditioned for use by others. Make sure you have a sturdy wheel lock on the bike, and while this is especially important at night while you are away from the scooter, it is also worth doing this when you are stopping for a couple of hours. If you can afford it, do not make too many compromises in terms of the quality of the bike and particularly the helmet before you ride. Bear in mind that technically you should have temporary Vietnamese motorcycle license, and although the police don't check these, it can land you in trouble if you are involved in an accident, so be particularly cautious if you don't arrange one of these documents.